After eight successful instructional DVDs on a wide variety of topics, Hendrik decided to finally turn his attention to hand tools, releasing two new productions in 2012. “Hand Planing Techniques” is the second DVD newly released in 2012, but let us first hear about the long awaited sharpening production: “Sharpening & Tuning Hand Planes and Chisels”. 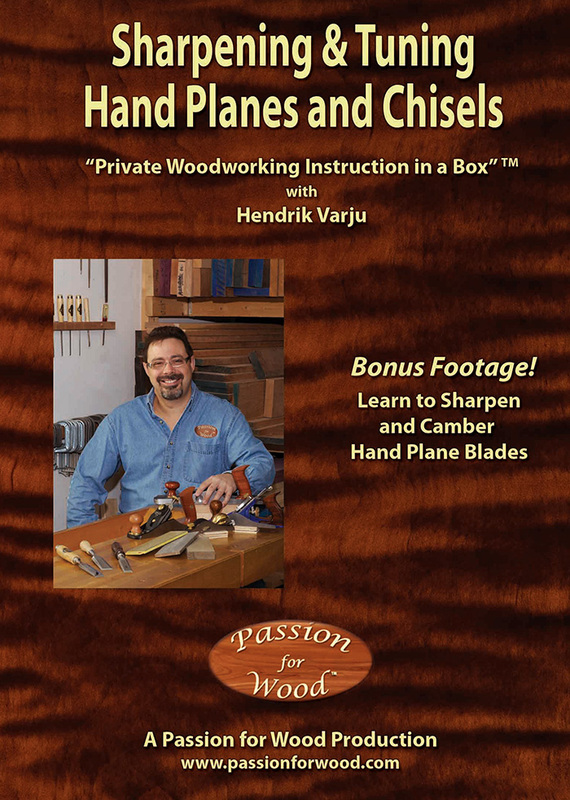 “Sharpening & Tuning Hand Planes and Chisels” covers everything you need to know to successfully tune and sharpen your chisels and hand planes, all spread over nearly 9 hours of footage on 5 disks. As is Hendrik’s usual style, this DVD set is a detailed step-by-step course – not the “usual” DVD fare that may have disappointed you in the past. The DVD starts by taking you through some of the sharpening stones and other supplies Hendrik recommends for tuning and sharpening work. He also shows you two different grinders, with tool rests, that he uses in his workshop to hollow grind his tools before honing to final sharpness. After reviewing the required supplies, Hendrik then takes you through his step-by-step list for chisel and hand plane tuning. He then demonstrates each and every technique, from cleaning and inspecting the frog, to grinding a back-bevel on a chipbreaker, filing a back-bevel in the mouth, grinding the lever cap, flattening, smoothing and bevelling the sole, and flattening the backs of chisels and hand plane blades. In Hendrik’s usual methodical way, he spends no less than six full chapters taking you through the various steps, demonstrating on chisels, block planes and larger bench planes. He demonstrates on many of his planes, from older less expensive brands to higher quality models that don’t need nearly as much work. He covers everything in excruciating detail. After demonstrating the tuning and tool refinement techniques, Hendrik then reviews the concept of effective cutting angles in a very long and detailed chapter, complete with drawings and sketches to teach you all the principles you need to know. This is all required background information that then launches you into three full chapters on sharpening technique. One chapter covers hollow grinding, including the theory behind it and multiple demonstrations on how to accomplish it, both with chisels and hand plane blades. You learn about variable speed grinders, using an effective tool rest and how to set it up to grind the correct angles. Hendrik covers bluing of steel and how to avoid it, as well as how to increase or decrease your sharpening angle, often because the manufacturer of the tool used an angle not suitable to the work. He even shows you an ingenious way to lower the sharpening angle of your tool rest without having to adjust it at all! Another full chapter covers Hendrik’s views on honing guides versus free-hand honing. He encourages you to learn to hone free-hand whenever possible, giving you the ability to sharpen your tools effectively yet quickly. However, he also sees merit in using a honing guide for certain tools that might be too difficult to balance free hand. It is wonderful to not just see the techniques and demonstrations but also to hear Hendrik’s reasoning every step of the way. Another full chapter is devoted specifically to free-hand honing technique. Hendrik shows you his stance, his hand and finger positions and strategies to maintain the correct angle without introducing errors into the sharpening angle. He takes you through a succession of stones, starting coarse enough to remove the large burrs left by the grinder and finishing off so sharp he can shave with the tool. If you’ve never achieved that kind of sharpness before, you are in for a treat. As in all of Hendrik’s DVDs, this production is full of time tested techniques. There is always a wonderful mix of theory, with sketches and full explanations, married with real-time demonstations you can duplicate in your own workshop. This is the beauty of these multiple disk courses, which give you an absolutely enormous level of detail, but in a “live demonstration” format just not possible in a woodworking book. The most important aspect of this production, as with all the others, is Hendrik’s full demonstrations done in real time. He doesn’t assume prior knowledge, so even a beginner will be able to follow along the journey. Yet he has a knack for covering the basics while simultaneously covering the most detailed points even a more experienced woodworker will learn from. Hendrik always says that sharpening is the kind of skill you develop so slowly that you always feel like you knew nothing the year before. The gain in knowledge and experience is incremental, with very subtle intricacies being learned and further refined each year. Hendrik gives you complete access not just to his techniques, which took years to develop, but even to his every thought as he works, no matter how subtle and nuanced it may be. There is plenty of refined detail to learn, even for the more experienced viewer. Hendrik explains in this DVD that hand tools are extremely important. While he uses machinery to complete all of the heavy “grunt work” in his workshop, he explains just how important the final finishing touches of a hand plane can be. So even though hand tools might only be used for a small fraction of the time compared to table saw, jointer and other machines, hand tools complete some of the most critical steps in a fine piece of furniture. Sometimes a hand tool is faster than a particular machining method. At other times, hand tools are the only tools capable of the task. Hendrik is known for his extremely long and detailed “bonus footage” sections in his instructional DVD courses and this DVD is no exception. The bonus footage is called “Cambered Cutting Edges”. In a chapter spanning over one hour (longer than most other DVDs!) called “Cambering Hand Plane Blades”, Hendrik reviews the kinds of hand planes that should have cambered blades and the kinds that should not. He gives ample reasons for using cambered blades and then goes on to demonstrate their benefits, including showing you how to use a cambered blade to remove twist from a board’s edge. In short, “Sharpening & Tuning Hand Planes and Chisels” is the most complete DVD course of its kind on this subject matter. You’ll appreciate the depth of the information and the subtle details fleshed out at every opportunity. As always, Hendrik’s DVD courses are not like the usual 45 to 60 minute production you may have found disappointing in the past. Hendrik takes you through every procedure in real time, ensuring that you fully understand the thinking behind every step. Most woodworking videos and television shows just show you the “gist” of each technique, editing away the finer details and problems that might arise. If you truly wish to elevate your chisel and hand plane tuning and sharpening to a professional level, the details are everything. Normally, Hendrik can only cover all of the high-level details he loves to teach in person, but he has once again succeeded at giving you personal coaching in a DVD format. As a 5-DVD boxed set running for over 8 1/2 hours, “Sharpening & Tuning Hand Planes and Chisels” will become the leading instructional woodworking DVD in this area. As the trademarked name says, this is “Private Woodworking Instruction in a Box” and nothing short of Hendrik’s in-shop seminars and courses even comes close.